[After-Sell Service:] Every Keyboard bought from Genjia Tech supports 30 days Return & Refund policy WITHOUT hassle; Get the full refund quickly or free replacement if you aren't completely satisfied; Free lifetime technical support and 3 months manufacturer's warranty. It's just like a notebook with this keyboard case. Support all the function keys of iPad system. Support adjust the tilt angle with stand. Support Close-to-Sleep with the magnetic closure. Support take a selfie through space key. Support remove the keyboard to use the case on its own to hold files and folders. 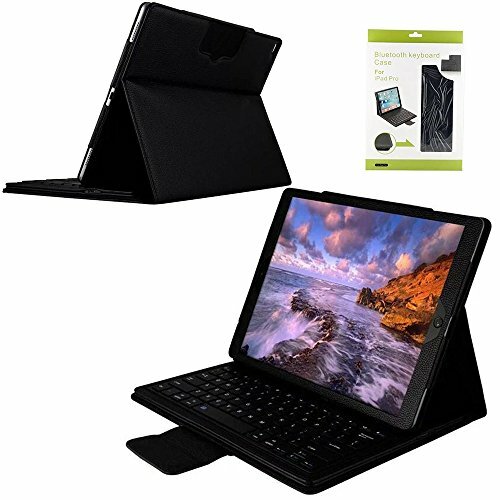 PERFECT-CUT: Buletooth folio smart keyboard case specially designed for Apple iPad Pro 12.9 inch (2015 release). Ultra thin and dirt-resistance wireless keyboard case with built-in working 100hours high capacity rechargeable battery. MAGNETIC & REMOVABLE KEYBOARD: It's easy to detach the keyboard from the cover. iPad snaps to magnetic upright angle for typing and media viewing or lies flat over the keys for handheld use. Adjustable stand securely holds your tablet in ideal landscape mode. ABS KEYBOARD: Provides a natural, smooth typing experience like using a normal keyboard, much higher quality than cheap silicone keys.Buy it if you need a much faster response time than silicone keys. MAXIMUM PROTECTION CASE: The premium folio PU leather case provides all-around protection against dirt, scratches, stains, splashes, dents or bumps. SMART FOLIO KEYBOARD CASE: Auto sleep and keyboard shortcuts function. Power-saving sleep mode triggered after 10 minutes idle, and the keyboard indicators go off to. To wake up from sleep mode, just press any key. Specific shortcut keys operate various features and functions right from the keyboard (Refer to the user manual). If you have any questions about this product by Genjia, contact us by completing and submitting the form below. If you are looking for a specif part number, please include it with your message.